Was 2010 really such a heart-breaking year? That is certainly the impression one gets viewing the winners of the annual World Press Photo competition on display in the foyer of the Canadian War Museum until Aug. 28. There are the more than 170 images from the world’s top news photographers — the globe-trotting, camera-carrying men and women who descended upon Haiti after the earthquake, trailed Somali refugees across the Gulf of Aden in rickety boats, watched Thailand’s Red Shirt Revolution unfold, and captured the last moments of the sick and dying in homes and hovels around the world. These photos, picked by an international jury, do, indeed, break your heart. But a truly memorable news photograph must display more than death and destruction. It must convey searing human emotion written across the faces of the people photographed. It must tell a story beyond the obvious. The signature photo from the competition this year is that of an 18-year-old Afghani woman, Bibi Aisha, whose nose and ears were cut off by her husband’s family. Her crime: Trying to flee an abusive marriage. The photograph, which eventually ended up on the cover of Time magazine, was taken by South African photographer Jodi Bieber. At first glance, you only see a beautiful young woman in a headscarf. Then you see that her nose is gone. Despite that deformity, the inner beauty of Aisha shines through. People have been known to pass by the photo and not even realize the woman’s nose is missing. The photograph of Aisha offers hope. It is one woman’s triumph over adversity. Even after suffering so cruelly, the young woman knows how to smile, to look serene and to project a great beauty. Aisha now lives in the United States and is undergoing reconstructive surgery. 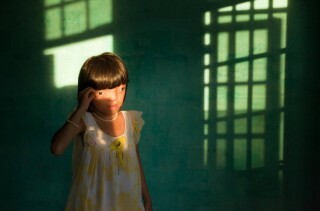 Similarily, consider the photograph of Nguyen Thi Li, 9, by American photographer Ed Kashi. The child suffers various disabilities because her parents were exposed to Agent Orange, the chemical used by the Americans to terrorize the Vietnamese countyside. The effects of that chemical remain in the DNA of its victims. But the photograph is not disturbing. It is a loving, aesthetically beautiful portrait of a survivor. My favourite photo among the exhibition captures a dramatic moment in the anti-government riots in Bangkok last year. 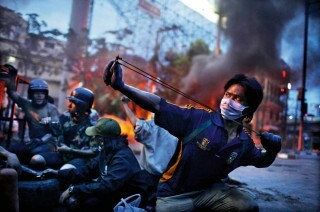 A young man is holding a slingshot. The elastic is stretched taut. This modern-day David is about to launch a rock against the Goliath-like establishment he is battling. The unidentified man is not shooting rifles or launching rockets. He is using what is probably one of the oldest weapons known to mankind. There are surely poems written about this man in the cafes of Bangkok.